This is it. 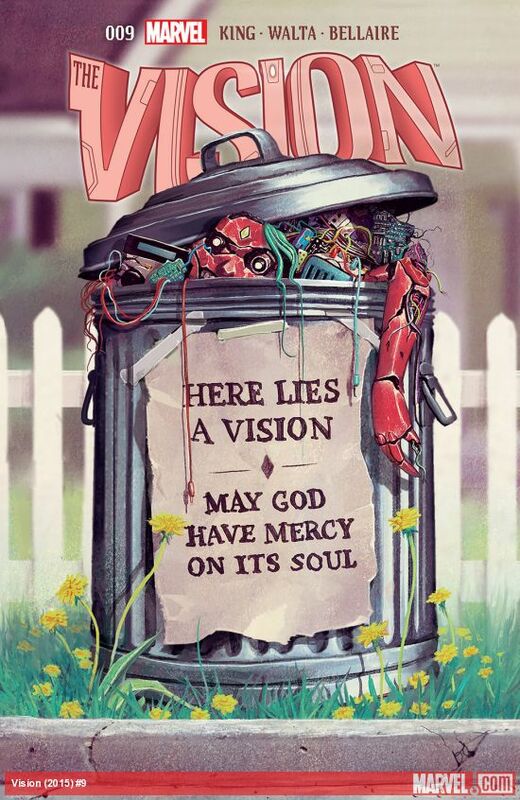 This is where, after 8 issues of all the horror being kept beneath a façade, Vision is finally directly impacted by everything that’s happened. And it hurts. It’s a testament to the Tom King’s skilled writing that he has managed to, in such a short time, create both an incredibly compelling cast of characters, and such a suspensful plot. In many other comic series, the death of a character like Vin wouldn’t mean much. He would be a character solely created for and defined by the arc he is in: he is introduced, plays his role, and dies within a few issues. The next arc rolls around, and he’s all but forgotten. Or at least it would be like that, if these characters weren’t so chillingly real. They shouldn’t be. They’re just a family of robots. And yet they are quite possibly the most human characters you’ll find in any comic book today. I can't even make a joke here. This issue doesn’t cover much ground in terms of progressing the story forward. The final panel literally takes place a few short minutes after the first one. Most of the pages are spent re-introducing us to Victor Mancha, and revealing his dark secret. That's the first time that hand has ever looked dangerous. It turns out goody two shoes Victor Mancha is actually a serious vibranium junkie, and has been for a long, long time. On one hand it’s a plot decision that fits into the story they are telling in this comic, as well as the themes of something darker hidden beneath a seemingly innocent surface. 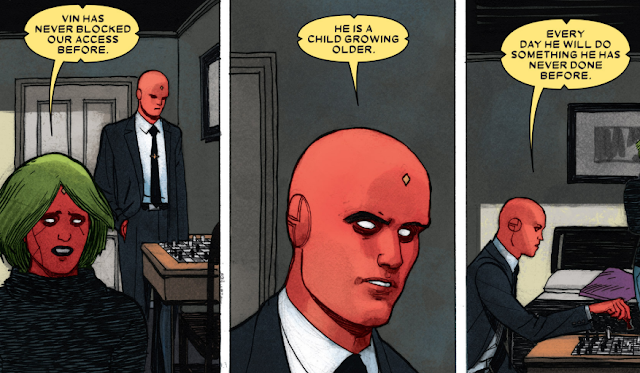 On the other hand, and this is one of the biggest negatives of this issue, it’s pretty big retcon that seems very much out of character for Victor, and could seem like an insult to longtime fans of his who have admired his integrity. It’s an especially hard blow when you realize it’s his addiction that resulted in Vin’s accidental death. There's no ambiguity here. Vision #1 promised us this is where the Knowles die. Yay. 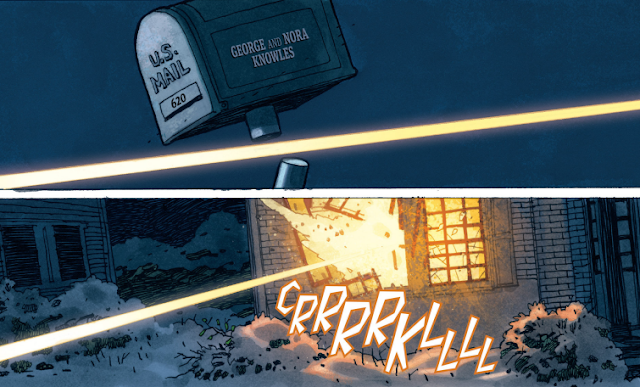 Regardless of how you feel about some of the themes in the issue, it’s hard to deny that it very well executed. 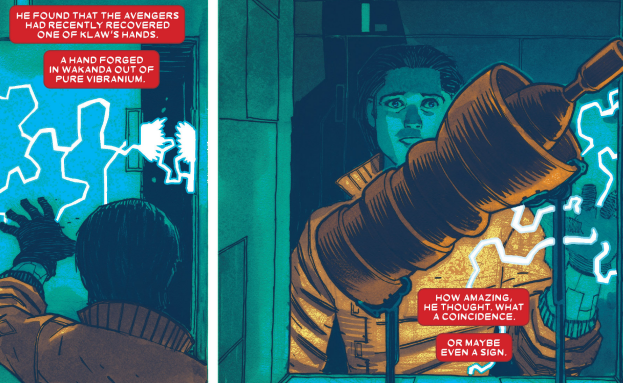 For the flashback scenes, colorist Jordie Bellaire uses a completely cold color palate on Gabriel Walta’s always fantastic art, with the exception of the yellow of Victor’s clothes and the vibranium, strongly highlighting the connection between them. 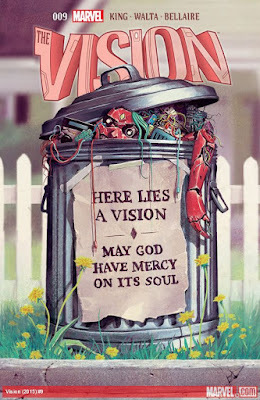 Overall, this is another strong issue of Vision. While the ending is more about the promise of what’s to come, the rest does an excellent job of putting all the pieces in place. I’m both terrified and excited about what might happen next, and what more can you ask for?